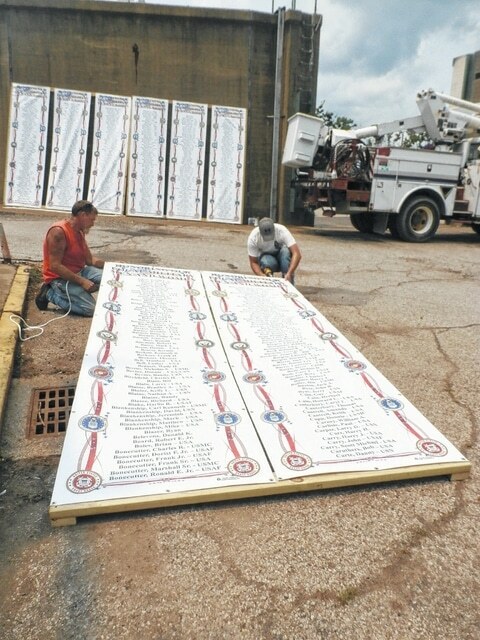 Workers with the City of Point Pleasant hang panels containing names of Mason Countians who are serving, or have served, their country in the armed forces. The panels are placed along the floodwall in preparation for the Point Pleasant Sternwheel Regatta which begins Thursday. POINT PLEASANT — The Point Pleasant Sternwheel Regatta begins Thursday, but preparations are already under way for the popular festival, which will welcome an important and solemn attraction — the West Virginia Vietnam Memorial Wall. This mobile wall will be on display throughout the Regatta and be open 24 hours a day at Riverfront Park. A ceremony will be conducted at the wall at 1 p.m. July 4 at the park with a 21-gun salute, “Taps” being played and Del. Jim Butler speaking. This mobile wall is made up of 12 panels depicting 732 West Virginians who were killed, held as POW’s and those listed as MIA’s during the Vietnam War. Panels are two feet wide by four feet in height, made of a light composite material. The length of the wall is 13 feet on each of the two-sided sections bringing the total length of the wall to 26 feet. The wall is currently traveling throughout the state with the intention of visiting every county. The stop in Point Pleasant will mean it has stopped in 23 counties. The mobile wall is not intended to have a permanent home because it’s meant to visit as many communities as possible. This gives those who have never visited the Vietnam War Memorial in Washington, D.C., or have never had an opportunity to visit the “moving wall,” which travels the United States, a chance to see the names of those West Virginians who sacrificed for their country during the war. On Tuesday, employees with the City of Point Pleasant Street Department were hanging panels containing the names of men and women from Mason County who are, or have served, their country in the armed forces. The panels will hang at the entrance to Riverfront Park at 4th Street. In addition to the Vietnam Memorial Wall on display, the first day of the Regatta will also be filled with activities as a section of Main Street is closed to traffic and filled with food vendors, games and activities for families. The Regatta remains a popular event and admission is free. In addition, on Thursday, the queen and teen pageants take place at 6:30 p.m. on the main stage at Riverfront Park. The popular local band, Two River Junction then performs a free concert at 8 p.m. on the main stage with its mix of classic rock, rhythm and blues and country. This year’s Regatta is July 2-4. Read more about Friday and Saturday’s Regatta events in Thursday’s edition of the Point Pleasant Register.